The DNC needs leadership that has the lived experience and cultural competence to build power in a highly racially charged environment. Immediately after giving his victory speech in November 2008, Barack Obama said to Howard Dean, then chairman of the Democratic National Committee (DNC), “I wouldn’t have won without you. Your fifty-state strategy laid the groundwork for my campaign.” Dean’s strategy, implemented in 2005, funded full-time DNC staff in every state so that the party had a presence and the capacity to do organizing everywhere. 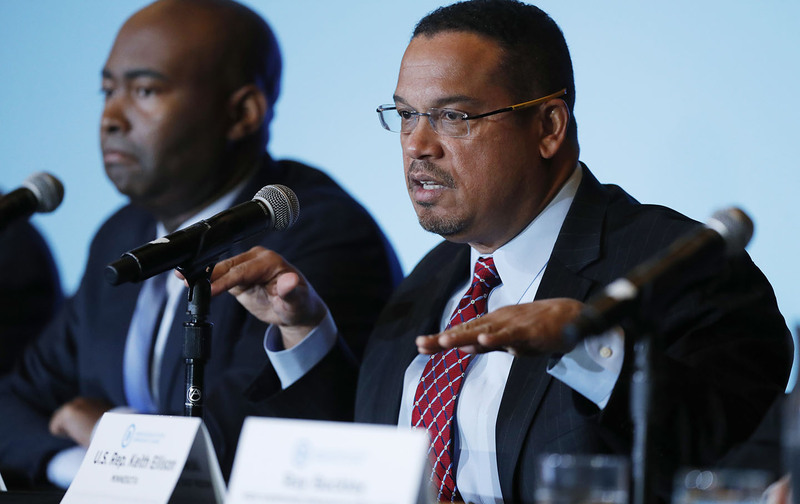 Now the Democrats are in the process of selecting a new chairperson for the party, and that new leader’s team, strategy, and work over the next four years can pave the path for a Democratic victory in 2020. But just as Dean’s then-controversial strategy put in place the pieces necessary for success in 2008, the next DNC chair must respond to this moment in history with effective plans and programs tailored for the specific conditions that we face today. The single greatest force shaping American politics today is the demographic revolution that is transforming the racial composition of the US population. Since passage of the 1965 Voting Rights and Immigration and Nationality Acts, tens of millions of people of color have joined the electorate, rapidly swelling the ranks of people of color from 12 percent of the population in 1965 to 38.4 percent today. The force of that revolution propelled a black man into the White House, and then Donald Trump rode the backlash to that revolution to his apparent narrow Electoral College win. If the Democratic Party is going to effectively rebuild from the ashes of this defeat and reclaim control of the federal government, it must put in place new leadership that has the lived experience, cultural competence, and electoral sophistication to build power and win elections in a highly racially charged environment. That is the context for the contest for new DNC chair, and it is the framework for the Democracy in Color Chair Candidates Forum that will be held on Monday in Washington, DC, at George Washington University. I am helping to organize the forum, along with the teams at Democracy in Color, mitú, and Inclusv. We will explore three areas that demand immediate attention and complete rethinking if we are going to win in the years ahead. First and foremost, the Democratic Party must be race-conscious and not be race-neutral or color-blind. This flies in the face of much contemporary liberal orthodoxy, but the hard truth of the matter is that a color-blind approach does not work in a country still seared by contemporary racial inequality, discrimination, and oppression. There has been a lot of talk since the election about whether the Democratic Party should target disaffected white workers or people of color (we’ll set aside for the moment the fact that people of color are pretty disaffected too, and most non-disaffected whites also voted for Trump). The larger point that this argument and false dichotomy misses is that we need to speak to the racial realities of the entire American electorate—the fears of most whites and the hopes and dreams of people of color and progressive whites. In 2008, when race was squarely on the table and people tried to use out-of-context quotes from Obama’s black pastor against the candidate, Obama responded by giving a racially explicit and inspiring speech that educated, inspired, and united the majority of voters in the majority of states. Cultural competence within the Democratic Party must extend to all areas of the operation, not just the rhetoric of the chair. It must manifest itself in the composition of the staff and top leadership she or he hires, the expertise and experience of the consultants retained, and the strategic priority and focus of the party’s financial expenditures. How much of the resources and money will go towards chasing the shrinking sector of the electorate made up of the conservative white working class, and how much will go to maximizing the power and potential of the most rapidly growing sectors of the population—the country’s communities of color, who make up 46 percent of all Democratic voters? Without a party and party leadership that possesses the skill to engage in that conversation, Democrats will continue to be outflanked by Republicans and conservatives who simply seek to exploit racial anxiety and insecurity. The DNC and its partner organizations spend hundreds of millions of dollars every two-year cycle. Much of that money is wasted on paid advertising that is ineffective, ephemeral, and misdirected. Democrats heavily outspent Trump and the Republicans last year, so raising money wasn’t the problem. Spending it well is where they fell far short. The most important strategic spending shift Democrats can make is redirecting massive amounts of money away from paid advertising and towards a permanent staff presence on the ground in strategic regions of battleground states. Howard Dean was on the right track in 2005. Going forward, that strategy needs to be sharpened using the lens of the country’s changing demographics to align the party’s investments with the areas that will see the largest growth of Democratic-leaning voters. The Democratic Party needs to have year-round organizers developing relationships and working in close concert with community-based organizations and leaders to strengthen their capacity to communicate with and mobilize voters. For a party with the word “Democratic” in its name, the DNC has historically operated in a disappointingly opaque, inaccessible, and unaccountable fashion. As a result, the millions of people who entrust the party with their votes, money, and volunteer time have little input into the priorities, policies, and activities of the institution that purports to represent them. This is not only wrong on general principle, but it ignores the imperative of building the kind of strong, passionate, engaged grassroots constituency that is necessary to transform a nation. The first step the next chair should take to fix this problem is to conduct a transparent and brutally honest assessment of exactly what happened in 2016. There are a lot of misunderstandings, incorrect conclusions, and false and facile assumptions floating around and influencing preliminary plans for progressives in the future. One such myth, for example, is that millions of voters abandoned Democrats and flocked to the Trump campaign, when in fact Clinton got just about the same number of votes that Obama did in 2012 (Trump exceeded Romney’s 2012 numbers by 2 million votes, and third-party candidates received 5 million more votes than they did in 2016). Understanding exactly what happened and why is an essential first step to winning back the White House. In addition to the autopsy, the DNC should abandon the penchant for secrecy and embrace the principles of transparency and accountability that helped inspire and engage millions of people to participate in the 2008 Obama campaign. During that effort, David Plouffe provided regular updates via YouTube on campaign strategy and progress. With today’s tech tools, electronic town-hall meetings could be held on a quarterly basis, supplemented by in-person reports and strategy sessions across the country during the course of the year. Embracing these best practices of organizational functioning will deepen the confidence of Democrats across the country and motivate them to continue to contribute their time and money in the months and years ahead. These are dark days in American politics, but Democrats and progressives must never forget that we are in fact the majority of people in this country. Each of the last three presidential elections have proved that there is a new American majority consisting of the overwhelming majority of people of color and a meaningful minority of whites who vote progressive. The mission of the DNC and its next chair is to start now to put in place the infrastructure to translate that population majority into an electoral majority in enough states to win back the White House and Congress so that we can continue to build a vibrant, just, inclusive multiracial society. That journey begins with making sure the next DNC chair has the skills, experience, strategy and sophistication to lead us on that journey. We’ll ask them these questions and more on Monday.